AMD’s second-generation Ryzen 5 2600 CPU, which is expected to launch in April this year, has been spotted on Geekbench. The latest benchmark results hint that the AMD Ryzen 5 2600 CPU might replace the Ryzen 5 1600. Geekbench is a popular browser-based benchmarking site, which examines both single-core and multi-core performance metrics. In the Geekbench, AMD Ryzen 5 2600 scored 4,269 in the single-thread, which in the multi-threaded testing it got 20,102 scores. When we compare this to the Ryzen 5 1600, the Ryzen 5 2600 is reportedly 7-15 percent faster in single-threaded performance, while it is 22-31 percent faster in multi-threaded performance. The AMD Ryzen 5 1600 is a 6-core/12-thread processor clocked at 3.2GHz to 3.6GHz with the same cache arrangement and TDP. Geekbench also revealed the specs of AMD Ryzen 5 2600 CPU. It has the same 6-core/12-thread configuration, but upgraded clocks: the base clock is now up to 3.4 GHz from 3.2 GHz, while the boost clock is now up to 3.8 GHz from 3.6 GHz. The TDP in the second-generation Ryzen 5 2600 CPU is still 65 W and L2+L3 cache memory remains at 19 MB. 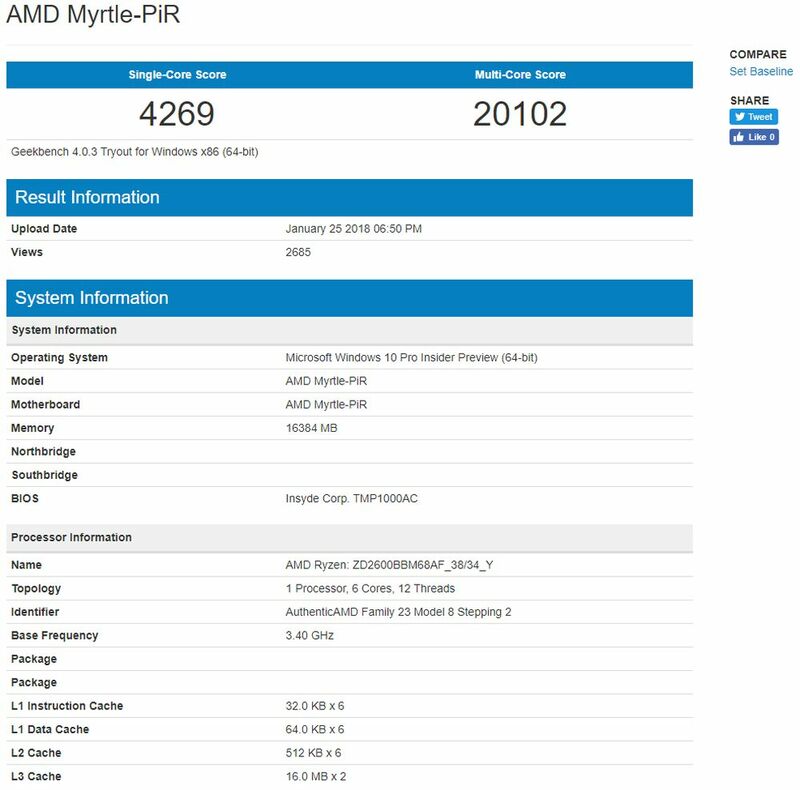 For the refresh, AMD’s Pinnacle Ridge is rumored to launch in the month of April, as per the recent reports. However, you should take this with a grain of salt as back in September there was a buzz claiming Pinnacle Ridge will release in February. It is also expected that Pinnacle Ridge CPUs will be built on a 12-nanometer LP node, versus 14nm for present generation Summit Ridge parts. AMD’s upcoming Pinnacle Ridge is basically an optimized version of Summit Ridge CPUs, built on a smaller manufacturing process. The tweaked architecture is said to bring growth in performance and will provide a better power efficiency. However, you should not confuse between the Pinnacle Ridge and Zen 2 a.k.a Matise that is rumored to out in 2019. AMD’s Ryzen 5 2600 CPU is rumored to get the release sometime during or after April that is when AMD’s new Ryzen 2000 series CPUs will be launched.